All I think of when I hear of lions, is cute little 'Simba', from the 'Lion King' and I can't imagine how such cruelty can be acted upon all the Simbas, the iconic 'King of the Jungle'. But some humans show a callous disregard for animals, and that is not surprising in relation to the cruelty we deliver to our own species. But there are different kinds of humans, divided on the subject of human and animal rights, the proponents of protecting injustices at any level will band together to protect all species under one struggle. As such the anti-Lion-Trade advocates have galvanised strongly this year against the scourge of animal trophy and 'profiteering myth-based medicinal' hunting, from the rhinos to the lions, the reckless elimination of iconic species for delusional healing purposes is indicative of the madness of our species. Lions, have always been victims to game hunting for those insecure, cold, callous and egotistical humans who can only affirm their value by boasting trophy killings as a display of their dominion over all other animals. In South Africa these individuals have their own packs in the form of trophy hunting clubs and farms, whereby lions are bred for the sole purpose of allowing these blood-thirsty humans to kill in cowardly acts, as the lions are not given an equal chance to attack, stuck behind fences. In South Africa, according to Pickover (2004), "A small, but vociferous, pro-gun and pro-hunting lobby, largely made up of white Afrikaans-speaking males is bank rolling the trophy hunting industry. Seemingly entrenched Government bureaucrats who were appointed during the Apartheid era and who are also mostly white, Afrikaans-speaking men and who on the whole support hunting, in turn, prop them up." Hunters always use the argument that they are bringing in revenue to the country, but governments don't bother to interrogate that such blood-money goes to the minority closed historical privileged groups, not the poor and nor does this benefit conservation. Trophy hunting goes against the grain of conservation that seeks to preserve species and their habitats. Eco-tourism and real conservation efforts are sustainable and the economic benefits are extended to historically disadvantaged communities. Noting that this does not attempt to romanticise traditional indigenous practices, as muti killings abound and leopard skinning for African monarch affirmation continues unabated. In 2004, Morley in his paper on The Myth of Trophy Hunting as Conservation, is succinct and reveals the contradictions and double-standards from a historical timeline to present. "The colour issue cannot be ignored. As most of the profits are retained by the landowners, hunting companies, their international agents and taxidermists, this so-called 'sport' heightens the concentration of wealth in the hands of the well-positioned few instead of the needy many." A South African trophy hunting site excerpt reflects how backward this sector is: "Hunt "Leo with a minimum of the .375 caliber, as is the lawful minimum in most African countries. One-shot kills with the .375 cannot always be guaranteed so you may consider a larger [calibre] if you shoot it well." Rhinos also feature on their menu, yet no-one targets them in the rhino decimation lobbying. Why is that? How are they less responsible for the decline of any species under threat or general animal rights? Furthermore, this hunting site boasts teaching a child to trophy hunt, "[X] has shown a great love for the wild places of Africa and for hunting. He is a crack shot and took his first animal at the age of five with a single shot." The demand is global and so South African hunting farms and poachers are the enablers, eager to make money off lion body parts. A 2011 US petition from wildlife groups in an attempt to ban trophy imports and list lions as endangered, documented that "from 1998 through 2008, at least 7,445 wild lions were traded internationally, and at least 4,021 of them were brought to the United States, including more than 3,600 for recreational trophy hunting purposes." Preceding this was an attempt in 2004 to list lions on Convention on International Trade in Endangered Species (CITIES). A lion skeleton is worth $10,000 in the Asian countries, a rapid profit jump from $4,000 in 2010. Lion bones and rhino horns have become key trade targets. This has increased the revenue of the trophy hunting farms and illegal poaching. 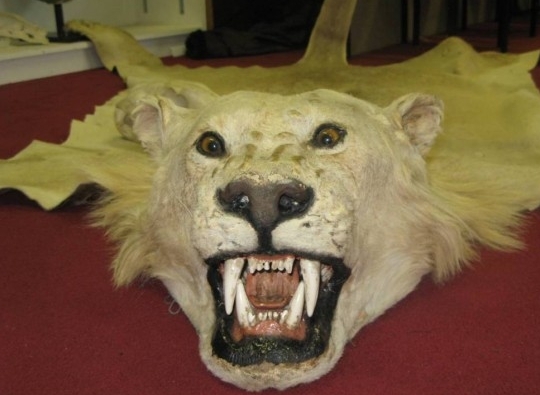 An export of 54 lion trophies to Laos (previous total to Laos 2000-2009 was 1). The Humane Society International conducted an analysis of lion trophy trade data in 2007 , using the UNEPWCMC CITES Trade Database, revealing that from 1994 to 2005, South Africa reported exporting 877 captive-bred lions as trophies; most of these (57.5% or 504) were imported to the United States. Between 1975 and 2005, 41 countries imported captive-bred lion trophies from South Africa, the United States imported more captive-bred lion trophies from South Africa than any other country in all years on record; in 2005, the United States imported 58.3% (120 of 206) of these lion trophies; Spain, Portugal and Germany also import many captive bred lion trophies from South Africa. The Asian market is taking over the demand-supply as it does with rhino horn trading. The only way to end this and stop the brutality is to act globally and mobilise. Injustice is one struggle, be it human or animal! "She stared around her with confused, amber eyes. The lioness, sleek and beautiful, had just been separated from her three young cubs. They stood calling their mother, divided from her by a tall, electrified wire fence. Try to imagine that you have been separated from your children and are about to be shot, execution style. What you feel was mirrored in those amber eyes. Later, an impala carcass was used in an attempt to lure the lioness away from the fence, and away from her cubs. She followed the lure almost reluctantly, despite having been starved for the previous two days. She was a mother, and she turned back to be with her young ones. The lioness walked alongside the fence, calling to the cubs. They, clearly as confused as she, called back. Then she saw men approaching in a vehicle. She stared at them, without aggression, though with eyes that spoke of disbelief at the inconceivability of the situation, of being close to her cubs, yet apart. She moved a short distance away from the fence, then turned back to her cubs. She stepped towards them. A thunderous crash violated the gentle sounds of the bush. She spun crazily, high in the air, and tumbled onto the electric fence. The wires bit at her, shocking her body and she shuddered down on to the ground, where young eyes witnessed a mother's murder. The cubs fled. The last sound the lioness heard was the second crash. Then everything turned black. . . Her death was a shocking testimony to the monster which greed and self-hatred make of some men. The professional hunter and his German client approached the crumbled, lifeless form of the lioness. The client, typical of his kind, crouched next to the dead lioness, demonstrating the perversity of his sport by admiring and patting that which he had just destroyed. He opened her jaws and turned his hypocritical face to the cameras. Shutters clicked. Later, the lioness was taken to the skinning shed. There the trackers worked with skill as they removed her coat, the first stage of the process of her later transformation by taxidermists into a "trophy." On the floor, as they worked, the mother's milk spilt from her teats and mingled with her blood." According to Avaaz, now experts say lion bones from these killing farms are being exported to phony 'medicine' makers in Asia for record profits. Trade is exploding and experts fear that as prices rise, even wild lions, with only 20,000 left in Africa, will come under poaching attack. Avaaz, a global lobbyist and advocate on all injustices, launched a petition a few days ago to request that South African President Jacob Zuma, place a ban on this practice.